Avoiding the Sun to Avoid Skin Cancer? Recent Studies Challenge That Advice. My perfect day involves an 85-90 degree day at a beach (preferably with waves), my girlfriend, other friends, a lounge chair, a cooler full of sandwiches and beer. Honestly…I could repeat that day 10,000 times on various beaches of the world an never get bored. The thing is, I’m a fair skinned German-Irish-Scandinavian mixed breed. I’ve always felt a bit of guilt for going out in the sun, because we’ve been trained that it is like playing Russian Roulette with skin cancer. Fair skinned people like me are especially warned to avoid sun exposure. Is that sound advice? 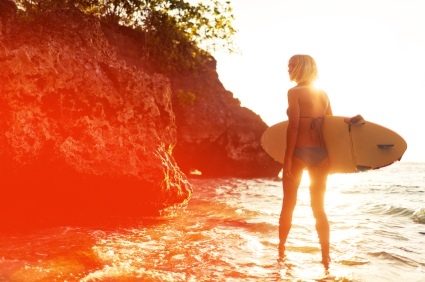 Should You Be Worried If You Sport a Tan In the Summer? Are you risking your long-term health if you spend time outdoors soaking up rays? I can’t answer that question for you. In fact, I am not giving any medical advice here. You have to make your own decisions. Enjoying life in the sun has a built in calculated risk, but so does driving a car to work, or flying in a plane. That being said, there is some strong evidence against avoiding the sun. In fact the advice of avoiding the sun from 12-4pm, may do more harm than good—>At what time should one go out in the sun? Outdoor Workers Get Skin Cancer Less Than Indoor Workers? Here is a link, to a study which found that melanoma has been on the rise for indoor workers, but NOT outdoor workers. Some interesting findings for sure! …Perhaps Indoor UV Exposure is to Blame? Explanation of Chart: Outdoor workers get a good balance of UVA and UVB rays and therefore have a steady level of Vitamin D3. 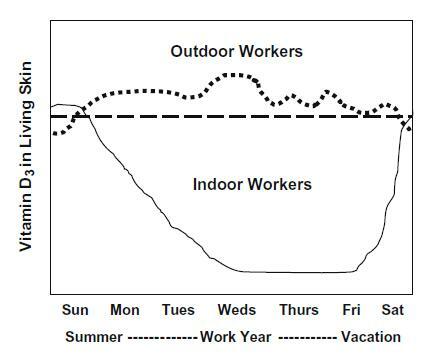 As you can see indoor workers typically have a poor levels of vitamin D3, except for on the weekends and perhaps summer and vacations. Sunscreens Block Out the Good Rays as Well! There are studies that suggest that sunscreens do not help in preventing melanoma. In effect, the sunscreen is doing a similar thing to glass…blocking UVB and allowing in more UVA. So sunscreen isn’t helping much in this regard as well. Europe Has UVA Blocking Sunscreen and the US Doesn’t! I just found an amazing site dedicated to sunscreen. Here’s a post you will want to read if you use sunscreen: Sunscreens Exposed – 9 Surprising Truths. “Sunscreen chemicals approved in Europe but not by the FDA provide up to five times more UVA protection; U.S. companies have been waiting five years for FDA approval to use the same compounds”. I want some good European sunscreen! If you are after good sunscreen you can actually look up your brand in the sidebar and they will tell you the UVA protection level. 15-30 Minutes of Mid Day Sun Exposure Every Other Day? It doesn’t take a heck of a lot of sun to get vitamin D to healthy levels. Studies have found as little as 5-10 minutes of sun exposure 3 times per week can boost your vitamin D levels to where they need to be. My guess is that people with darker skin may need a bit more than that. No sunscreen the first 15 minutes of my beach time. Apply only the best UVA blocking spray I can find after 15 minutes of sun exposure (see picture above). Take daily vitamins that contain vitamin D.
Regular stops to happy hours with outdoor seating…order buffalo wings and hefeweizen (yes please)! Avoid sunburns, cheap sunblock, and too much time in the office during summer. I want to give a shout out to Mark’s Daily Apple, which linked to this outstanding post, by a blog called “That Paleo Guy”: More Sun Science. This guys does an excellent job making the argument that sensible sun exposure helps prevent melanoma, not cause it. Again, none of this is meant to be medical advice…you need to weight the evidence and decide for yourself whether you want to go out in the sun or not. Living in Iceland, I almost never get any useful sun except for a few months in the summer, that’s why I take about 6.000IU of Vitamin D every day. I didn’t know about the UVA rays actually breaking down Vitamin D in the skin until now, that’s pretty interesting. Amen to that Rusty! Being a Southern Californian living in the Midwest is especially hard this time of year when everything turns grey. I have had great help during the winter months fighting off SAD with vitamin D supplements. Now, I am going to have to go through the sunscreens and toss out the useless ones as I made the wrong assumption I had good ones. kinda off topic- but what are your thoughts on creatine supplementation? I was looking at older blog entries from your site cerca ~2007, and it seems that you’ve come around. well I’ve been on phase I (skipping leg day) for a month: so far, so good, my upper body muscles are gorged, I’ve even lost a couple pounds of fat in the process. however, I am concerned that by the time I reach phase III, I’ll be even lighter from calorie deficit. Should I start taking creatine now or is it strictly for when you plateau during phase III? here are my stats for reference: 68 inches, 148lbs. long, strong legs, skinny, short torso (almost like a soccer player). Interesting post Rusty. There is a study for everything. Hard to know what to believe. Just the other day I read a study that said being overweight wasn’t unhealthy. This guy had all kinds of facts and research to back up us point. Seems like there is a study for everything. Great article, Rusty! And thanks for thinking of us Down Under. I grew up in outback Queensland and North Queensland, and spent nearly every yearly summer holiday at the surf. You learn a lot about skin protection just by growing up in Oz, as skin cancer is one of our major killers (even more than crocs, mate! ), but your article had plenty that I didn’t know. We actually have medical clinics all over the country where you can get a free skin check for melanomas, and we are encouraged to get this done yearly. Cheers, and have a blessed Christmas and New Year. I don’t know what about melanoma, but without suncream, I get terrible sun burn…. Very interesting article. I always thought that only early morning or late evening sun was beneficial and tried to avoid afternoon sun at all costs. Guess I don’t need to worry so much about that after all. Did not know about windows only blocking the UVB rays either. Another case of what’s natural being better than what’s artificial eh? @Wood, this is why you should always wear sunblock, however you should really invest in one that has UVA blocking properties too. People wear sunblock assuming that it is protecting them, because they don’t get burnt, (UVB rays are what cause most burns.) UVA rays dont manifest themselves on the surface as much, so you don’t see their damage. They are what penetrate deep into your skin and wreck havoc. So if you wear cheap sunblock you may not be getting burnt on the surface, but deep under your skin you are getting fried. First they cut a layer of the cancer off of your face, then they blow dry the wound to stop the bleeding. They then send the layer to the lab, where they chart its layout under a microscope, then project it onto a piece of graph paper. The results are sent back to the surgeon, who then cuts another layer off of your face, based on the distribution on the graph. This layer is then sent back to the lab where it is charted again… the process goes on and on until the lab sees that the layer has no more cancer in it. Long story short: Protect your face and ears, and buy really good FULL spectrum sunscreen. Also if you see any suspicious spots, get them checked out ASAP. Yet Another Great Article Rusty, Thank you! I would like to get more sunlight but I was born and raised in the London were we mostly get cloudy weather. I’m continuing to follow your advice on ESE+a mix of Bova, HIIT, Skipping for cardio, lifting light with tension, adequate rest, controlling my calorie intake and enjoying life. And you know what?…. It’s working really really fast! The only thing is… I’m at a sticking point where I can see the front 6 abs but have a stubborn pooch. I’ve been planking my A off and regular cardio. Water intake is good and not much salt levels. Do you suppose it could be an estrogen thing? Hey! Thanks for the post, I’m an American spending my first Christmas in Australia so it’s totally relevant for me! 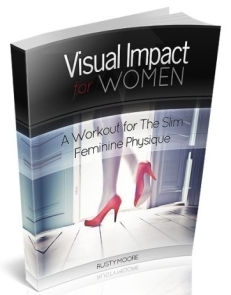 Also I just wrote a post on my blog about your site and the Visual Impact for Women program. I just purchased it and started… can’t wait to see the results! Happy Holidays! Great post Rusty. Just reading the first paragraph of this post put me in such a good mood. That sounds like the most perfect day. I’ve always been a slightly tanned person but I’ve always been very cautious with the sun. I’ll never go out without sunscreen. @sakkadai – Hey what foods are you consuming throughout the day? Good stuff as always Rusty, and highly interesting&useful. Thanks for your great advice Rusty.it is true that Outdoor workers get a good balance of UVA and UVB rays and therefore have a steady level of Vitamin D3. Hope you and the family are doing GREAT. Best wishes for an amazing holiday season and a healthy, peaceful and very successful 2012. I had a dermatologist take a look at my over “sunned” body and face. He would never publicly admit this…but he believes the sun is critical for our well being and he himself does NOT use sunscreen. He does limit his exposure. 2 things; skin cancer was pretty much non-existent before the 1920’s. before our excessive production of sugar based goods and sugar intake. (soda being a big one here). Sun damage to the skin IS real and if you live in a sunny climate, you must be on the look out. I have a tiny sun spot under my eye. Basically some rough skin. The sad thing is that most md’s will want to cut that out. According my friend there is just no need for it, but you do have to keep an eye on it. @srdjan — Hi srdjan. I’m from India so my diet is predominately rice based. I have my breakfast at 7 in the morning (a rice based dish) and the some whole wheat biscuits at 11. Then lunch at 1 and dinner at around 9. So i’m guessing that the 8 hour interval between 1 and 9 is the cause of my acidity. I’m not even sure if i can have fruits during this period as they are usually saturated with fructose. your thoughts on this?? Hey Rusty! A late Merry Christmas to you. I’m a teenager that wants to get fit by summer. But I wanna lose some annoying muscle in my shoulders, arms, and legs. Could i lift heavy with less reps/sets and lose bulky muscles at the same time? I dont know if you’ve heard of them, but Girls’ Generation would be my ideal look but sometimes i feel lost in all the fitness terms and info. 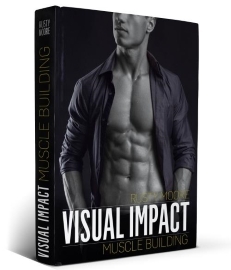 Hey Rusty, I would like to commend you on your website and fitness regime, but I would like to know if there is any chance of getting more updates on your blog here, as well as facebook? Hi Rusty – interesting take on sunlight / cancer / vitamin D – I suppose everything in balance! If only I could get 15-30 minutes of sun exposure here in Maidenhead, it’s almost permanently grey and wet at this time of year!!! Wow, this is really interesting. Every time you think you know what’s what a new article or new info comes along to challenge that belief! Thanks for such a great article. I’ve been looking into this and being african american and living in Florida.. I’ve been taught to hate the sun but after realizing the sun helps us synthesize vitamin D I started spending the first few minutes on the beach without a beach umbrella. The sun here in Florida can get brutally hot but its worth it during the summer to get all that good vitamin D. On the flip side, I’ve always known that it is the chemicals in most of those pseudo sunscreens that ultimately cause cancer and not the sun. There are a number of organic natural sunscreens out there for my “fair skinned” friends you just have to look for them. The sun is our friend not the enemy as we have been taught. Thanks again for your post Rusty! Great article on skin care. It may be even more relevant in the winter when here in Canada we tend to stay inside more than the summer, and get less sunlight, and less Vitamin D. It is wise to get into the sun all year long to up your Vitamin D. I’ll be looking for quality sunscreen this summer for myself and my kids. Thanks for another great article. Cheers! It seems we as a society go in cycles. We spend years screwing up what nature intended and then follow up with years of trying to correct it. Seems like sun exposure is one of those things. The sun i my friend! I always feel better after a good day in the sun, so even if it’s a little bit bad for your skin… would the fact that it brings you joy not be just as important. Because that fact makes it healthy as well. Training and nutrition is essential. Good nutrition is essential for weight loss. There are bad habits ingrained in most people. But with some basic rules of good nutrition easy. Nice article! Unfortunatly many people can’t spend much time on the outdoors, maybe after they read this change their mind. hey rusty ive been following your blog for a while now and I honestly think its the best fitness blog on the web! keep up the great work! My question is this: about two years ago I dropped pretty much all direct resistance training on my legs, but they still have too much muscle for my taste. Would marathon cardio help this or am I just doomed to have big legs because of my genes? I have sensitive skin so tanning is hard for me. But my family is going to Florida for spring break this spring. I’ll definitely check out the European sunscreen and see if I can get it online. Thanks for the heads up! Love this blog! Thanks for your post, from the Aussies! Our government is currently running a campaign “there’s no such thing as a safe tan” and it’s really good to see some more balanced discussion for once. This is very interesting. I try to get outside the gym everyday for at least 30 minutes just to breathe a little slower and get out in the sun. It’s tough when the days are cold and gray…I occasionally mix in a little vit D supplement in the winter. Thanks for this amazing post. It’s really appreciable work. Some facts are interesting such as UVA and UVB . You should blog more about it. I just love the content. Just a personal observation for what it is worth. Since being on a paleo diet things have changed in my life- Not only weight loss but muscle gain occured and for the first time in my life- this former chubby doughboy could go outdoors in public without a shirt. Working without a shirt in my garden and doing some body weight exercises in the yard- usually at noon- I never got a sun burn (and I took in a lot of sun) and not even my drivers left arm got very dark. Does a high fat diet prevent burning? Has worked for me. It’s hard to find a balance between getting the right amount of vitamin D and not getting a sunburn. Your plan sounds smart! Great article Rusty. My strategy is to make sure I don’t do too much of anything. If you do anyting for too long it usually has a negative effect on you. Same thing goes for food and exercise. Variety is key. I’ve been reading a lot of Mark Sisson’s stuff for the past couple of months, and like what’s suggested both by him and Rusty in the article, I’m going to try and get 15 minutes of sun a day once it starts warming up again. My pale chest could use some color. You need to post more frequently. It is hard to maintain interest in your site. Very great article. I always thought that only early morning or late evening sun was beneficial and tried to avoid afternoon sun at all costs. Guess I don’t need to worry so much about that after all. Thank you for this article!! I love nothing more than working out in the sun yet have had no issue with skin cancer! Going to the indoor gym is like going to the dentist! So thanks for the positive message regarding sun exposure! Really!! 1. Nature isn’t stupid. If the sun was that devastating, we wouldn’t have evolved into an environment in which it was a factor. Obviously, if you off-load common sense and stay out in the hot, bright light of the sun until you are flaming red, you’re going to pay the price. But that rosy response is a warning in and of itself, much like the pain you feel when you smash your thumb with a hammer. It’s your body saying, “This is BAD.” Listen to your body, listen to common sense. 2. I don’t know if this is correct, but I seem to remember reading that you should apply sunscreen 30 minutes or so before you’re out in the sunlight. So, I don’t know if your plan to avoid sunscreen for the first 15 minutes will serve you properly. Might want to research that. Good post Rusty, I think along with many things in life you have to have enough knowledge to know how much is enough and how much is too much. Sun exposure is the same way. I do feel this isn’t the same sun as when I was a kid. Now I am really worried to know that people working in a glass building are actually m missing out on UVB. This really is a thing to worry about as I spend most of my day inside. I wish you would blog more frequently Rusty. Your blog is one of my favourties. Interesting stuff, I think it’s yet another case for moderation. Like so many other things in our lives, extremes in either direction are rarely healthy. I’m really glad I came here and saw this post. I have pretty fair skin myself, and constantly find myself in debates with my dark-skinned wife about whether or not being in the sun is harmful or helpful. Recently, I’ve heard things from various sources about how our skin gets helpful vitamin D from the sun. Now, armed with this information (and the further study you suggest), I can make better decisions about whether or not we should be out in the sun or not! This was a great post, very informative. I had no idea there were different types of sunscreen in Europe. I want some better sunscreen too, come on FDA! It’s true you definitely can’t live in a box your whole life and never see the sun but there comes a point when there is too much as well. You want to do what is best for your skin and your health. This is a great post and I really found it interesting. I personally love going to the beach but worry about getting skin cancer. I also have fair skin. I have known for awhile that vitamin D was important and one should be getting some sun exposure. I was not aware of the UVA rays and that the US does not have sunscreen that protects against that. I do my best to not be in the sun too much but I love the outdoors so it proves difficult. So interesting about the indoor workers too. I knew being inside all day was not a good thing but had no idea about what the window did. too much sun is dangerous..
Hi Rusty! 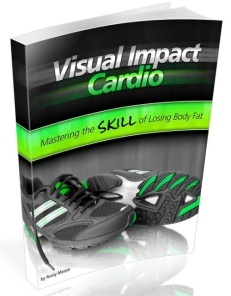 I purchased Visual Impact a while back and I was wondering something. I have a fairly high BF percentage (25%). Should I be starting the program in Phase III, instead of Phase I? I’ve been dieting down and mainly working in Phase III… Just not sure if that’s optimal. Great post. I really appreciated your tone in that there are so many things we are still unsure about regarding sun exposure. I think you have provided some really good advice and information for your readers to make some educated habit changes. I am quite fair skinned as well and I find that I burn less if I wait a bit before putting on sunscreen. Now I know why! AUSTRALIANS BEWARE. We have the highest incidence of skin cancer in the world and Queensland, our most popular vacation centre, is the nation’s capital of skin cancer. This is why the Govt runs the skin cancer awareness programme. I’m not aware of many (if any) countries that have as high a portion of white skinned (Anglo – Celtic) population living so close to the equator (within 20 deg of latitude). The amount of sun exposure you are subjected to can depend a lot on where you live. In Australia in mid summer you can get a very definite colour change of your skin with as little as 3 – 5 minutes exposure (as a friend of mine demonstrated while were on vacation in Qld. on summer). If you don’t have some tanning to protect your skin, you can get sun burned within 20 minutes. My doctor told me (Mediterranean decent) when checking out a mole on my skin, “you don’t have to worry too much about skin cancer. Its Celtic people like me with white skin (he also had red hair) that are most at risk.” He had had some skin spots removed from his arms by the time he was 50 y/o. My understanding is that we do need some sun exposure to get a dose of Vit. D to aid bone development and help ward off osteoporosis in old age. But be responsible about how you get it – especially if you are of Anglo, Celtic origin. I’ll quit my indoor job right away! What happened to you, Rusty? Did you have a heart attack? I have feeling the younger generation of today will have great problems with skin cancer when they’re older. Only sun exposure in moderation is healthy. Great blog Rusty! I’ve actually read through the whole thing over the last week or so, and I’ve picked up some wonderful tips and information from it. I hope life is treating you well, and you haven’t posted because you’re spending plenty of time having fun in the rest of your life – but I look forward to you updating! Awesome article and good to know. There are so many contradicting facts and theories out there that it’s hard to know which ones are right. I guess moderation in everything is the key. Great article! Everything in moderation including the sun. We need sun for our bodies to produce Vitamin D and keep us healthy … on the other hand too much sun can be dangerous. There are still so many things we are unsure about sun exposure. So I no longer bake in the sun and I do protect myself and my family while we are enjoying the sun! Love this article! Good job ! Finally somebody came out with the article like this. Love sun, love to do some sport on sunny beach and this article really encouraged me to keep going! 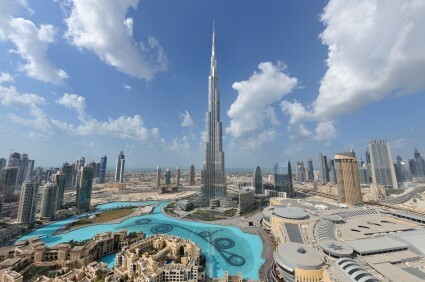 Always believed the sun is my friend and try to spend any minute to enjoy warm sunny day. I definitely agree that we’ve gone too far some children don’t get enough sunlight. Some sun is good for you because when you are outside vitamin D is absorbed. However, going to the beach for 6 hours without putting sun screen on because we just forgot is very bad for you. Make sure you put on sunscreen every hour. I think what is important is to have some level of sunlight exposure every other day, and using that sunlight expose to exercise. What I would do is sneak in a little jog every few days in the sun so that I not only get some sun, I get some exercise too. This is a great topic. I have recently been told about your blog by a patient and have liked what I’ve read so far. What I find interesting about this particular article is the fact that I was 23 when diagnosed with advanced melanoma. As a former ballet dancer, I spent most of my life in an artificially lit studio rather then in the sun, yet I battled the most deadly of skin cancers. My own research led me to other melanoma survivors with similar stories and resources that dispel traditional beliefs that the sun is dangerous. Try reading “The Healing Sun” by Richard Hobnay. It may be over a decade old, but research continues to back his theories. Hahahaha! This totally makes sense, but has shifted my paradigm a bit [I did aquatics in High School, put on the sun screen religiously, etc] Awesome post. Awesome article. I live in Olympia, WA so I know all about not getting enough sun. I spent a few years down in Arizona at college and I really enjoyed all the sunshine. I probably overdid it. I’m trying to be smarter now and find a balance though. The evidence seems pretty solid against roasting yourself to a crisp each and every day. It never seems to stop those unnaturally tanned leather skinned folk which seem to frequent each and every beach. I think the best option is to slap on the sunscreen and grab a panama hat – as missing out on the beach is not an option for me! The pendulum is swinging. It never made sense that the sun was bad for us. It is necessary. Moderation and conditioning are they key. Some studies suggest the sunscreen lotions pose their own threat to health. Get more information. Check out this article from our site. Great article, it all boils down to moderation. I try and get as much sun as possible if I can. During a hot and humid day, I managed to get a heat stroke, I learned from that one! I carry a water bottle with me at all times. Love the information you shared. I guess sun exposure can be good for your body but TOO MUCH EXPOSURE now that is not good. to your weblog? My blog site is in the very same niche as yours and my visitors would genuinely benefit from some of the information you present here. There is a lot of controversy around this subject. I was watching one of ” The Random Show ” episodes where Tim was trying out a supplement that might act as sunscreen.